iv. Totki Okoda 34 years: Resides in the creeks behind the School at the Ijaw fishermen settlement (He provided information for the gang about the school and the victims). The IGP’s Intelligence Response Team (IRT), working in synergy with the Tactical Intelligence Unit (TIU) of the Nigeria Police Force in a joint operation supervised by AIG Kayode Aderanti, AIG Zone 2, Lagos successfully smashed a notorious kidnap gang and arrested four (4) vicious kidnappers who are active members of the gang responsible for the kidnap for ransom of five (5) Turkish School Children and three (3) members of staff of the School in Ogun State on 13th January, 2017. 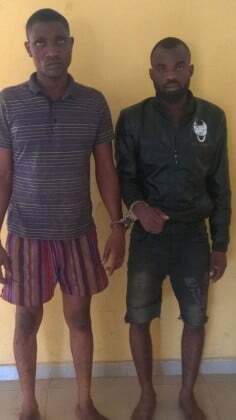 In the course of investigation into the dastardly crime, three suspects namely Are Philip Joel Kakadu aka “General Kakadu” a militant leader; Romeo Council aka “Raw” and Totki Okoda who lives in the fishermen’s community behind the school and provided information about the victims to his gang, were trailed and arrested at different locations in Delta, Ogun and Lagos States respectively, for the criminal roles they played in the commission of the crime. Further investigation and sustained pursuit of the matter by the Intelligence Response Team, led to the arrest of Bekewei Agbojule aka “Prince Yellow”, a principal suspect and one of the key members of the gang on the 25th January, 2017, at about 0700hrs in the morning. The suspect who is an Ijaw from Arogbo town in Ondo State was arrested after he came out of the creeks to enjoy his loot. One million two hundred thousand naira (#1,200,000) his share of the ransom money was recovered from him. The four suspects confessed to the crime, volunteered useful statements to the investigators and are cooperating with the Police. Concerted efforts are being made to arrest the remaining suspects who are at large. All the suspects will be arraigned in court on completion of investigation. Meanwhile, the Inspector General of Police, IGP Ibrahim K. Idris NPM, mni, is using this opportunity to assure every Nigerian that the Nigeria Police Force will continue to work assiduously to prevent crime and eliminate the fear of crime, so as to guarantee adequate security and safety of lives and properties across the country. The Police will equally ensure that those crimes that cannot be prevented are promptly detected and perpetrators prosecuted to serve as deterrent to prospective criminals. He urges the citizenry to be law abiding and continue to support the personnel of the Force deployed in their various localities.